Hello and welcome to my first post of 2016 ! Today we're kicking off the second week of the Frilly and Funkie challenge which is Holiday Hues. Now I know in the UK we don't celebrate Thanksgiving but the colours associated with this holiday are my favourites so these are the holiday hues that I chose. I'm keeping the 'how to' high level as I'll be back later this month with a step by step of how this journal cover came together. I've used lots of layers starting with dictionary paper and then acrylic paint. 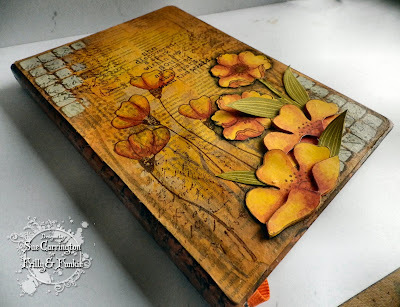 I've used the Tim Holtz stencil on opposite corners using the bumping technique and then stamped the script using a Tim Holtz stamp and Potting Soil Archival ink. 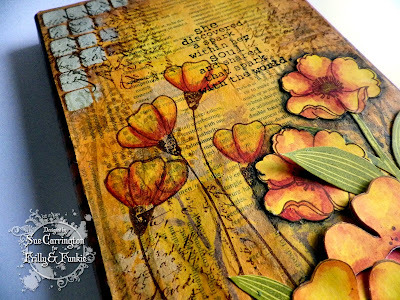 The Impression Obsession poppies stamp was used and the images stamped with Potting Soil Archival ink and they've then been painted with acrylic paint. I've used the Wendy Vecchi Artful Life set for the large flowers. They've been painted with acrylic paint, cut out and layered up. Impression Obsession do some fabulous sentiment stamps and the one I've used on this cover is one of my favourites. To finish I used Wendy's gold embossing paste and rubbed it around the edges with my finger, which is one of the techniques that Wendy shared at her workshop in London last year. I hope you get chance to join us for this challenge and do make sure you hop over to the Frilly and Funkie blog and check out the rest of the DT's fabulous projects. Fantastic project Sue and yes those colours are stunning together! Love how you used the different flowers, and so beautifully coloured! Can't wait for the step by step now to get more detail! This is such a beautiful creation...waiting to see your detailed tutorial! Gorgeous with flowers that are popping right off the page. I love this warm colour palette and I can't wait to see the detailed step x step. oh wow! This is so gorgeous! The colours are so warm. I can't wait to see all the details. 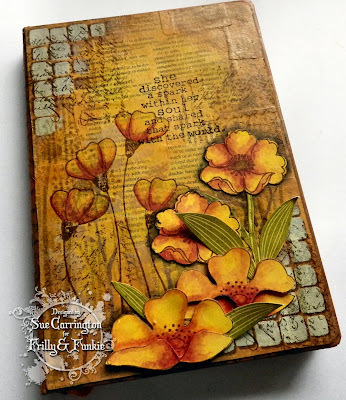 Gorgeous journal cover with some awesome hues that remind me of liquid sunshine! I could sit and stare at this for hours! You provided so much how to so far, but I'm looking forward to your tutorial! Wonderful warm make! Sorry I'm just now coming by. We were on vacation and it's taken me some time to get unpacked and have some 'me time'. I love autumnal color palettes too, and your journal cover is a breathtaking display of fall hues. I can't wait to see your tutorial for this!! 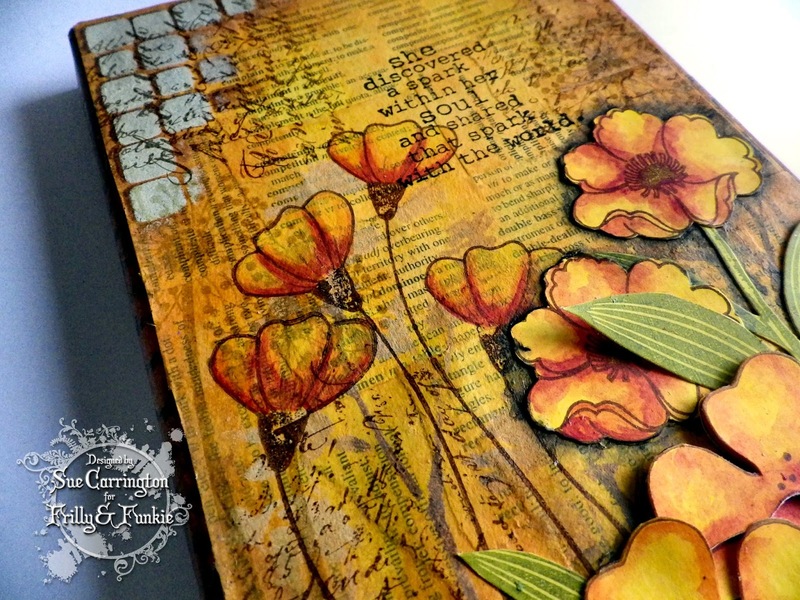 The layers of papers, inks, stamping, and flowers are absolutely gorgeous. 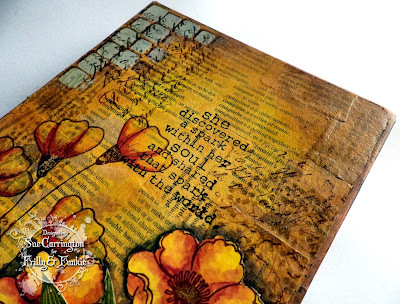 It's absolutely stunning, Sue - the warm colour tones are just what's needed in dull January days, and I'm in love with the vintage layers of text and texture. The flowers are beautiful too - a real showstopper this.